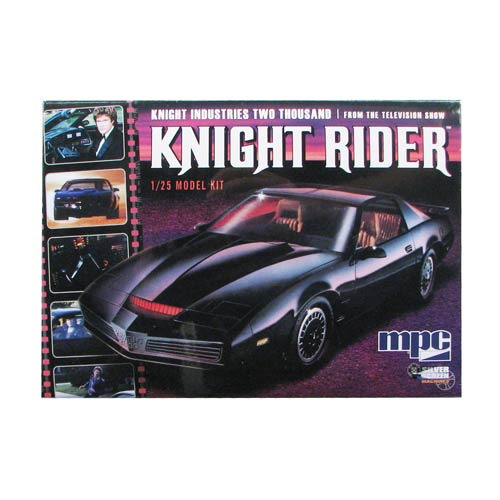 An essential addition to the Silver Screen Machines series from MPC, it's the Knight Rider KITT 1982 Pontiac Firebird 1:25 Model Kit! Molded in black with accurate details throughout, including the driver's cockpit, this KITT car is a great recreation of the vehicle you love from the 1980s TV show Knight Rider. The car even includes optional smoke tinted windows to add to the realism! The packaging also boasts a vintage 1980s MPC look. Glue and paint required, not included. Skill level 2. Ages 10 and up.